This week my kiddos are on spring break. That usually means the kids and I have a “stay-cation” and tap our trees for syrup, sort out outgrown clothing, arrange play dates galore, and bake up a storm together. I LOVE hanging out together, but this year we are doing something different and heading out of town. We are off to Williamsburg, VA (Yay!) and Washington D.C. (Yay!) for a spring break trip as a family! I am so excited! 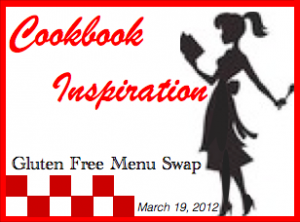 This week’s Gluten Free Menu Swap is being hosted by Wendy at Celiacs in the House. She picked Cookbook Inspiration as the theme. As I am out of town, I am just winging it more than usual and not using any cookbooks, BUT I do have a little cookbook hobby. Some of my favorites are any by Carol Fenster, especially her Gluten Free Celebrations cookbook. That was the first cookbook when we started on our GF journey that had food I felt I could serve my family with recipes that worked as gluten free. I have developed a lot of my own recipes since then, but Carol Fenster’s cookbooks showed me that it was possible to eat well and eat what my family enjoyed while being gluten free. Cooking for Isaiah has delicious recipes (I tried her recipes for donuts and jalepeño popper waffles at the GF & Allergen Free Expo last year) that taste like the real thing. Don’t expect high-fiber type recipes in this one, but that isn’t what it is for. It is for making yummy GFDF recipes that work (like those AMAZING donuts) that taste like your kids remember. Yum! For just dairy free (but with a lot of gluten free options also) you can’t go wrong with Go Dairy Free. This book has so many different types of dairy free recipes, from rich instant pudding or mousse, lasagna, ice “creams” to pumpkin “cheesecake”, there is something for everyone. And finally, Simply Sugar and Gluten Free is my cookbook love of choice for the times I want to cook without sugar using healthful ingredients, but still feel like we are being indulgent. My kids are wild about the chocolate avocado frosting! Almost every recipe contains options for making recipes dairy free if they aren’t already. My older daughter loves to cook out of this book. Because all the treats are also sugar free, I feel free to let baking experiments happen as often as she wants to putter in the kitchen. All the recipes and instructions are really clear and turn out wonderfully, even for the novice cook. My menu “plan” this week reflects our being out of town. We are staying in places with kitchens or kitchenettes. Monday – In Williamsburg, Va. Lunch – When traveling we usually have a cooler with veggie sticks, gluten & dairy free turkey sticks, boiled eggs, fruit, gluten free pretzels and kale chips (if I have time to make them). We restock during the trip at groceries as we travel. Tuesday – In Williamsburg, Va.
Dinner – One night we will eat out and one we will probably pick up gluten free freezer meals and a salad or chopped veggies at a grocery store. Saturday – Visit Mount Vernon then start heading home. Dinner – Depends on what we can forage at a local grocery store while on the way home. Not sure where we will spend the night until we see how the traveling goes. Dinner – On the rest of the way home, so mostly dinner is left over lunch snacks. We love Five Guys when we are on the road, the kids love it and their fries are to die for! Everything is gluten free but the bun,see the FAQ’s on their website. They cook in peanut oil, in case that’s an issue for you. There are a bunch of them in VA and DC area, they have a neat little tool on their website where you can find a restaurant along your route.Also check out the Bonefish Grill, there are several locations in Virgina, I’ve eaten in their restaurants in three locations and they have a fairly decent GF and DF options. and I’m sure there will be PF Chang’s where you are going which of course has a great GF menu, you should be able to view the menus online. I think Jimmy Johns and Chipotle have GF options, but you’d need to check online. Hope you enjoy Williamsburg, VA! We really enjoy living here! It has so many beautiful places to just walk around and take in the great scenery! In Williamsburg on DOG street (Duke of Gloucester) across from William and Mary, there is a sandwich shop called the Cheese Shop. It was a favorite in college, and when I was back they have started making sandwiches on Gluten free bread! They are very careful about using a clean work area to prevent cross contamination. I am not sure if all meats are gluten free, so be sure to ask. I was so happy to eat at an old favorite, and even more happy to not get sick!